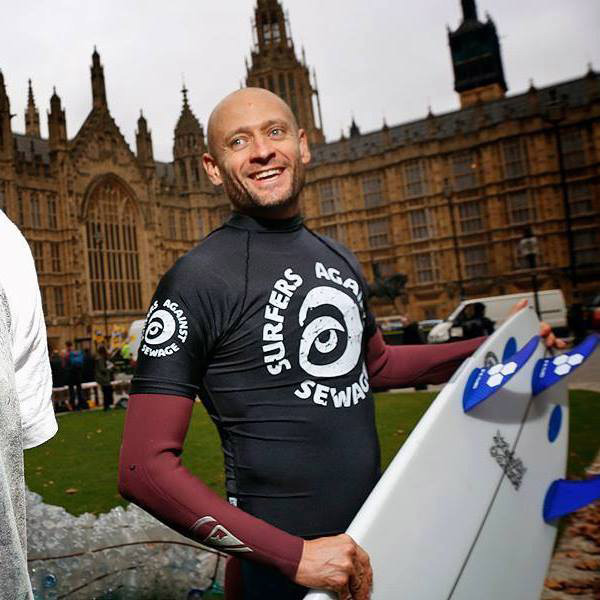 Hugo Tagholm became Chief Executive of Surfers Against Sewage in late 2008 and has overseen a sustained period of development, growth and impact for the organisation, which has galvanised its position as one of the UK’s most effective marine conservation charities. He has led the transition of the organisation from a single-issue campaign group to an environmental charity with extensive national and international influence. It is today recognized as one of the most influential enviro-surf NGOs in the world. It has a network of over 150,000 regular supporters, mobilises 15,000 community volunteers annually and has 60 regional chapters around the UK. Hugo has a longstanding history with SAS, first meeting its founders in 1991 when he entered the bodyboard category of the environmentally orientated ‘Surf To Save’ competition at Polzeath. He then became a paid-up member of the organisation and an active campaigner at water quality and climate change demos, before being invited to become a trustee in the 2000’s. Prior to taking the helm at SAS, Hugo worked at a senior level with various charities big and small, including the Climate Coalition and the Wildlife Trusts. For a number of years he also worked with alongside former Prime Minister’s wife, Sarah Brown, helping develop her charity PiggyBankKids (now TheirWorld), set up to help save the lives of premature babies and create opportunities for under privileged young people. Hugo is a member of the Vision Council for World Surfing Reserves, part of the Save the Waves Coalition, and is a former trustee and chairman of the Museum of British Surfing. Hugo lives in Truro, Cornwall with his wife and son Darwin, the loves of his life. Hugo is a surfer. His favourite wave is Droskyn. He supports Arsenal, the best football team in the world. He studied French & Philosophy at Exeter University, followed by Ecology & Conservation at Birkbeck University.